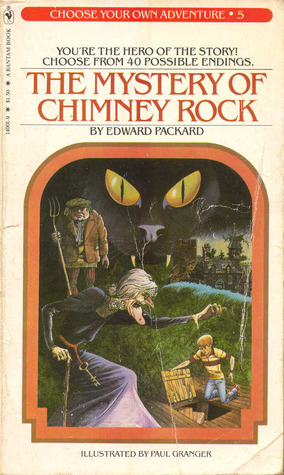 As a kid, I loved the Choose Your Own Adventure book series. For those of you deprived of this fun 80s reading experience, essentially every few pages you were forced to make a decision about what happens next. If you choose to go to talk to the mysterious old lady, you flip to page 35; but, if you choose to go into the secret passageway, you flip to page 57. Eventually, after so many twists and turns, you would usually end up in jail or dead. Only those who chose very wisely (or were just plain lucky) got the happy ending. Often, after reading one of these books so many times and continually meeting my unfortunate demise, I would get frustrated and read the last few pages to see the happy ending. Of course, this would then ruin the experience of ever reading the book again as I knew the ending I wanted and let it dictate all my future choices. Years later, as I train and think about the desired outcome of all this hard work and effort, I have to remind myself of this experience. I believe it is important to set goals for ourselves that establish what we want to happen. I want to lose 10 pounds. I want to complete a sub 4-hour marathon. I want to receive a promotion. I want to buy a house. These are all admirable goals and hopefully they are complemented by a clear set of actions to achieve them. However, I am learning in life that it is essential that we don’t chain ourselves to the idea that these things must happen. Yes, it would be great if all met our goals in life; but, I am now understanding through my training experience that it is important that we don’t write our own endings. Why? Because clutching so closely to these “perfect” desired outcomes only leads to disappointment. Essentially, we are not allowing the natural ebb and flow of life to happen. We are trying to deny the random happenstance and ignore the opportunities that will be presented. We need to have grit and determination to push ourselves. We need to have great focus to achieve our goals. But we also need to enjoy the spontaneity of life, make mistakes and accept that not everything is going to turn out exactly like we wanted. Our ending is not always going to be happy. Too often we cloud our mental wellness with these “musts”. We say we must be married by 25. We must make six figures by 30. We must have the picket fence and the 2.5 kids and the dog named Rex. And when these things don’t happen, we feel disappointed in life rather than celebrating all the unexpected stuff that we have experienced. I am competing in the Dakota Games in June and of course I have dreamed of the perfect ending in my head of what happens there in Fargo. Yet, if I say to myself that this ending must happen, I can almost guarantee I am going to be a pretty miserable person if and when it doesn’t. Instead, I am not going to dictate the ending. I am not going to put any “musts” on that weekend. Rather, I am going to focus on my training, do what I can each and everyday to prepare me to perform my best in the competition, and trust that if I put in the time and effort that I will find success in some shape or form. I am not going to spoil the ending of my own story. I am just going to choose my own adventure one page at a time.